Hi there, I am here with a very late post for today, but better later, than never, right? I am posting for Scrap-mart today and as I told you in my post last week, I am highlighting the brand new Spellbinders M-Bossibilities. The one I used here is called Trendy M-Bossibilities. I really love these new embossers, what an amazing idea to have two patterns in one! 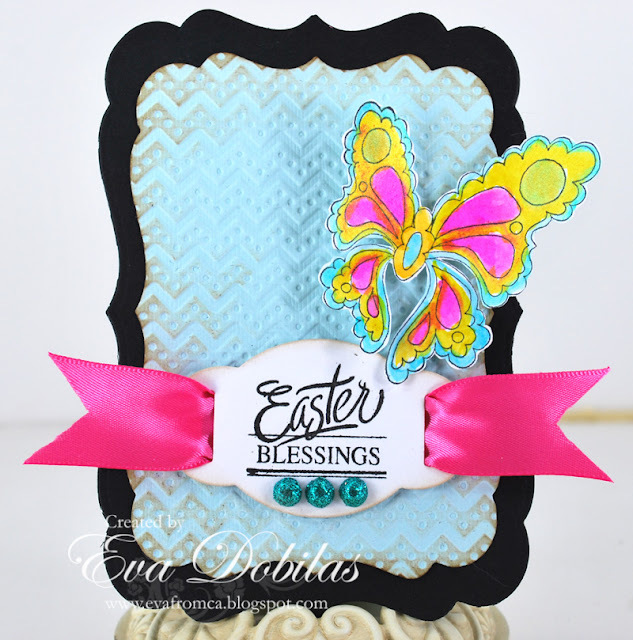 My pretty butterfly is Loralie's Lovely Butterfly Art stamp. So pretty, isn't it? And I had so much fun painting it in with Luminarte Twinkling H2O's. My sentiment came from the Justrite Stamps Spring Words set. I also used two more Spellbinders on this card. My card shape is Labels 8 Mega Nestabilities and my sentiment was stamped on Ribbon Tags Trio Three. Well, that is it for today. Hope you have a wonderful week!